Carbohydrate counting is hard enough with the nutrition facts labels in front of your nose and measuring cups by your side. It’s even more daunting when you eat restaurant foods with their unusually-sized breads, special sauces and obscure ingredients. Gather practical pointers to hone your restaurant carbohydrate counting skills and check out where you’ll find the nutrition facts for restaurant foods. Train eyes and hands at home: The more familiar you are with how your portions should look on a plate, the better you’ll estimate restaurant portions and carb counts. Keep measuring equipment (cups, spoons and a food scale) on your kitchen counter rather than buried in the cabinet. Palm of the hand (width and thickness) = a cooked 3 ounce portion of meat. Be familiar with carb counts of restaurant foods: You are likely a creature of habit with your food choices and regularly eat at a similar cadre of cafeterias, fast food joints and restaurants and order from a handful of the same menu options. Start by gathering the nutrition facts for these foods. Check out resources below. Ascertain nutrition information from similar foods: No nutrition information for some restaurant foods you eat? Check out the Nutrition Facts labels of similar foods in the supermarket or nutrition information from national chain restaurants selling similar foods. You’ll get a ballpark estimate. Check out cookbooks to learn about ethnic fare: Ethnic foods present particular challenges to carb counters. Borrow cookbooks from your local library. Thumb through them to learn what’s in sauces, marinades and more. Restaurant Nutrition Facts: What’s Available? Walk-up and order restaurants: The large national and regional restaurant chains generally offer nutrition information for their complete menu—from burger and pizza chains, to sub shops and coffee shops. Look under “nutrition information” on the restaurant’s website. Narrow the scope of your research. Gather information for the few restaurants you frequent and the few foods at these restaurants that you regularly eat. Sit-Down-and-Order Restaurants: The nutrition info for sit-down-and-order national restaurant chains is scarce. If the chains serve healthier dishes, they’ll gladly provide this nutrition info. But when it comes to their less healthy fare, they keep it a secret. If you call the corporate headquarters, say you have diabetes and ask for the carbohydrate information for a few items, you may get it. Independent restaurants: Nutrition information is generally not available for independently owned restaurants. Use the practical pointers (above) to make your best guestimates. Nutrition in the Fast Lane—The Fast Food Dining Guide. Franklin Publishing Inc. Indianapolis, IN, 800-634-1993 or www.fastfoodfacts.com. (Updated annually, includes nutrition information for about 50 popular chain restaurants). Invest time upfront to improve your portion estimating skills and learn the carbohydrate counts of the restaurant foods you eat often. With both skills and knowledge at your fingertips, your carb counts will be more accurate and your blood glucose control will likely improve. Hope Warshaw, MMSc, RD, CDE has been a dietitian and diabetes educator for more than 25 years and regularly counsels people with diabetes. 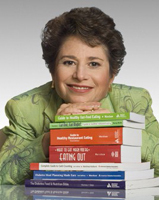 Hope is also a freelance writer and the author of several bestselling books published by the American Diabetes Association including: Complete Guide to Carb Counting and Guide to Healthy Restaurant Eating.